6. BI (Business Insider): “(Retailers) will even sometimes increase the ‘normal” price of an item before the holidays to make the discount seem bigger.” They will hike prices from 8% to as much as 23% on toys and tools. CCS: No. That absolutely will never happen here. If I offer discounts, it will be to benefit you, my customers, not to further augment my bank account. CCS: We offer one quality: High. Holidays or not, we’re still going to make our products in small batches to ensure the highest possible quality. CCS: No one likes an impatient jerk, especially not retail workers during the holidays. That being said, I have an entire array of fabulous customers, so I don’t have to worry about anyone not being nice. Besides, I have two children, so you can’t scare me. CCS: I do my level best to keep stock quantities up-to-date on my website. Some items I can restock quickly, but others take weeks to turn around. So, if I say I’m out, unfortunately, such is the case. 10: BI: “If you want Thanksgiving back, stop shopping on Thanksgiving.” Hint: Employees don’t want to be there. Some have to hire sitters for their kids, they have to leave early from dinner, and they miss family time. You can bet the CEOs are enjoying dining with their families around the table while their employees are losing their own family time. CCS: Thanksgiving is family time. We start with a special breakfast and watching the Macy’s Thanksgiving Day Parade. Then we go to my parents’ house for dinner and spend the night, waking up refreshed and recharged before coming home. We’re not going to work this day. I won’t take calls, reply to emails, or deal with customers in any way. How will you spend the holiday? Whether you’re spending Black Friday at the stores or at home, you can now go in to your shopping a bit more savvy. I invite you to spend part of your day with us, cruising our website and tagging us on social media. I read an article Sunday morning at Business Insider entitled “Things Most Black Friday Shoppers Don’t Know.” You can read it here. Even for a seasoned retail employee who’s seen her share of Black Fridays, the wife of a retail worker who had to get up early after Thanksgiving at the beach so her husband could get to work on Black Friday, and an indie manufacturer and business owner, there was some new and interesting – but common sense – facts here. In this two-part series, we’re going to look at the realities of retail and how my indie business is different – and better. CCS: On Black Friday, all that weekend, and Cyber Monday, we’re here for you. We may have limitations on our availability (e.g., Sunday morning during church and most times when we’re driving), but for the most part, we’ll be free to answer questions for you. You don’t have to fight screamin’ hordes of shoppers to get to us. CCS: Our prices are our prices all year and our merchandise is made in small batches to ensure freshness. Small, indie retailers can’t compete with discounted stuff made in overseas sweatshops, so we aren’t going to try. Our products are worth the price, and when’s the last time you saw a sweat shop slave do a happy dance because you bought that TV? CCS: We save our clearance sale prices for our annual clearance sale. 4. BI: “You rarely ever need to be there when the stores open – the sales last all day.” The reason for getting there uber-early is to ensure you get your preferred sizes. CCS: One soap fits all sizes, and our sales also will last throughout the weekend. We’re not so big into early bird promos. CCS: We will be running a special free shipping promotion, but it won’t begin until Black Friday. It will last all weekend, though, and on into Cyber Monday. 6. BI: “Stores will use all sorts of tricks to get you to spend more.” I saw this the last time I worked mall retail. CCS: No tricks, though we will suggest add-ons to your purchases, especially for gifts. The reason is simple: When I’m selling in person, my wares are spread out before you, and you can see what goes with what (like Orange Blossom soap and Orange Blossom & Amber Creme, or Christmas Candy Soaps with our Christmas Candies Lip Balms). You don’t have that online, so we will help point you to those complementary items. Come back tomorrow as we look at the other half of this list. Do any of these retail tricks surprise you? Are there others you’d add from your own experiences? 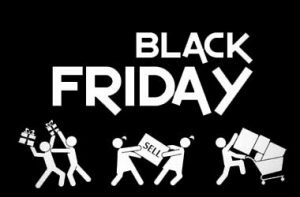 Black Friday as we know it is beginning to die. With retailers pushing sales and specials earlier in November, it is looking like the event of Black Friday is losing its significance as a holiday shopping day. When Cyber Monday came on the scene several years ago, buyers discovered they could wait a few days, avoid the crowds, and still get great specials, all ordered from their desk at work. Black Friday is so named because it is the official start of the holiday shopping season. As crowds surged, retailers’ profits for the year went from the red to the black, ensuring that they would end the year on a high note. To entice shoppers to go to their store over other stores, the retailers then began to offer insane specials and deals – a percentage off. Then a larger percentage off. Then a large percentage off and doorbuster deals. People would literally end up hospitalized or dead trying to beat someone else to this amazing deals. That money you saved on the 64″ flat-screen TV will go towards your hospital bills. And when all this simply wasn’t enough for the corporate greed, retailers then began opening earlier and earlier on Black Friday, eventually going so far as to opening doors on Thanksgiving afternoon, desperate for shoppers and little caring that their employees just might want to spend that day with their families before the craziness that is working retail during the holidays begins. We have seen major retailers shuttering their doors this year. Sears and Toys R Us both come to mind, and these stores closed for specific reasons. I know a couple of ladies from church who have a tradition of staying up late and shopping early, and one of the stores they’d hit in their dark-of-night mania was Toys R Us. Their kids are tweens and teens now, but shopping will take on a very different look for those shoppers for whom TRU was a staple. Over the course of the past week, I have seen Black Friday deals advertised on Amazon, Facebook, and Google. I’ve seen such retailers as The Disney Store promoting the opportunity to take advantage of Black Friday specials this week. You don’t even have to wait for the actual day of Black Friday anymore. A few clicks and you’re done. No crowds, no battling for parking at a bustling mall, no getting dressed in three layers of clothes to endure the chilling cold that typically is Black Friday morning while you wait for stores to open. When stores discount their prices for Black Friday, something happens the week before: They raise their prices. A recent article at Business Insider states that retailers will increases prices from 8-23% in the days and weeks prior to Black Friday so they still will get their same profit margins. I’ll be spending time in an upcoming blog post discussing that some more. As this Friday comes up, what’s your plan of attack? Will you be hitting the shops or clicking “buy now”? Have you finished shopping? Or do you shop artisans throughout the year?